West Central Initiative's Financial "Selfie"
West Central Initiative recently published our fiscal year 2017 annual report and included in the annual report was our June 30, 2017 “financial selfie.” Financial statements give a snapshot of an organization’s health one moment at a time. It would be nice if every June 30 the markets would be positive, but we all know that’s not how it works. WCI’s revenue for 2017 was spiked not only by a positive return on investments over the previous 12 months, but also reflects the quick recovery from the Brexit announcement that happened right before June 30, 2016 as we were putting our financials together. As reflected in the Statements of Activities and Financial Position section of the annual report, WCI’s assets topped $63 million – marking a record high year-end financial position for WCI. It’s easy for me to take a pause and think about what that means for west central Minnesota. I can still remember the phone call from our investment advisor when our endowment assets reached $10 million – it certainly was a cause for celebration! Many years ago, under the leadership of Wes Binner, WCI’s first development officer, WCI set a goal of having a $50 million dollar general endowment. I think Wes would take great pride in knowing that the endowment that he helped start continues to grow and serve the residents of west central Minnesota. The endowment goal remains in place today, with the fiscal year-end general endowment exceeding $33 million. In a previous blog, (WCI Financial Statements Explanation) I gave a quick breakdown of WCI’s assets. The information shared in that explanation remains true today. The numbers have grown since, but the percentages related to the total assets have stayed the same. A balance sheet gives a good picture of an organizations long term financial health, however all financial statements must be considered when planning for future direction and overall health of an organization. 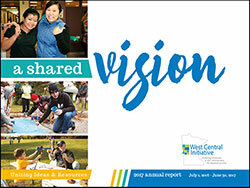 As we plan for the future, WCI’s staff and board of directors will continue to analyze trend data based on our financial health, the needs of the region, the economy and the mission of West Central Initiative: “Serving to improve west central Minnesota through funding, programs and technical assistance”. Thank you for your continued vote of confidence and partnering with West Central Initiative as together we unite ideas and resources to help people and communities create a better tomorrow. Cheers to you in 2018.